Out of Hyundai’s design centre in Irvine, California, a new shape is aimed at giving the sedan more street presence. It has the company’s signature cascading grille like that on the latest i30 and new Kona, with a chiselled air dam and sleek new headlights venturing into the front guards. Vertical daytime running lights add to a more dynamic appearance, while a more assertive side view and a completely re-worked tail end feature a clean boot design and slimmer rear lights. 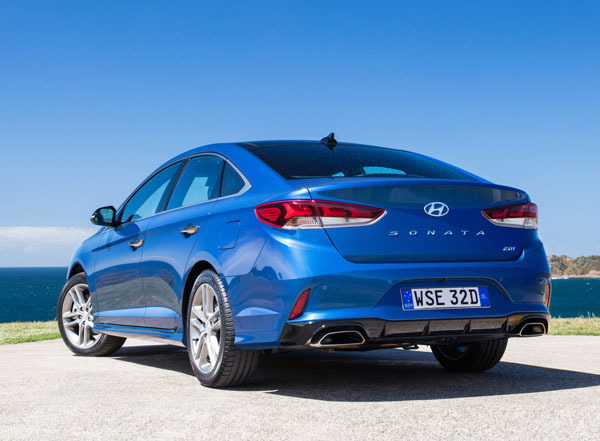 Chrome trim below the grille and on the lower edge of the front spoiler, as well as around the side window frames and belt line, add a touch of class, while Sonata Active rolls on a five-spoke wheel design. 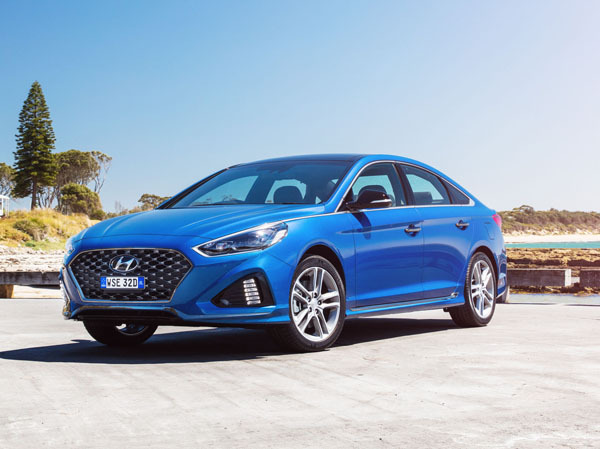 The new Sonata Active has seen a boost in equipment levels, with new three-spoke steering wheel, dual zone climate control air-con with automatic defogging, smart key and push-button start, plus a hands-free opening boot. Switches and buttons for heating, ventilation and air-conditioning controls have been given a gloss black ‘piano key’ finish and the centre console’s vertical component has been improved with lower switches closer to hand. A new 8-inch colour touchscreen display gives access to satellite navigation with Suna live traffic updates. Apple CarPlay and Android Auto are part of the deal. 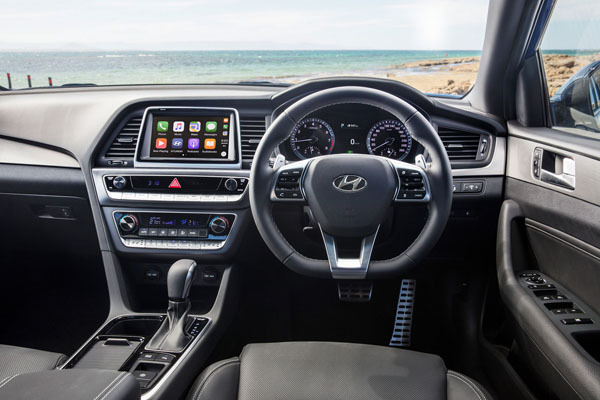 Other features of an upgraded audio system include Bluetooth phone connectivity and audio streaming, AM/FM radio, Aux and USB audio inputs. The 2018 Sonata keeps the same family of four-cylinder engines from the outgoing model. The Active is powered by the 2.4-litre, naturally-aspirated engine developing 138 kW at 6000 rpm and 241 Nm of torque at 4000 rpm. Power is put to ground via a six-speed automatic transmission. Premium has a turbocharged 2.0-litre unit, which puts out 180 kW at 6000 rpm, and 353 Nm between 1350 rpm and 4000 revs. It’s mated with a new eight-speed auto gearbox. The latest Active model has a host of advanced safety systems and technology. On board are electronic stability control, anti-locking brakes with brake assist and electronic brake-force distribution. Added to this are hill-start assist, traction control, emergency stop signal under hard braking, rear-view camera with dynamic guidelines and four-sensor rear park assist. Sonata Premium adds blind spot detection, driver inattention alert, lane change assist, lane departure warning, rear cross traffic alert, smart cruise control and four-sensor front park assist. Middle of the road is the phrase that springs to mind about the performance of the Sonata Active. There’s not a lot, apart from added assertive looks, to get excited about with the upgraded model. In fact, sadly the most memorable thing about my time with the sedan was a tendency for the brakes to grab. Maybe it was just this particular vehicle, or perhaps the way the pedal was treated. A calm, largely noise-free cabin, is the result of extensive sound deadening material in the dashboard, sound absorption materials under the floor pan, and a new underbody tray, which helps reduce unwanted road row and aerodynamically helps on saving petrol, the latter clocked at 11.8 litres per 100 kilometres in the city and 5.4 on the open road. The Sonata Active appears well-priced at a touch over 30k for a mid-size sedan. The 15-or-so grand more for the pleasure of Premium features seems a bit steep, especially as the technology is spectacularly cheap these days. Note: These prices do not include government or dealer delivery charges. Contact your local Hyundai dealer for drive-away prices.